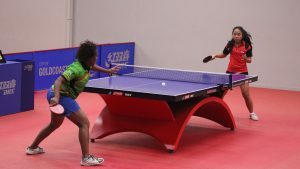 The 2018 ITTF-Oceania Championships have kicked off on the Gold Coast, and the linga franca is French. The combined team of New Caledonia and French Polynesia defeated the no.2 seeds Vanuatu 3-2 in the Women’s team event. The composite team came perilously close to defeat along the way, with each of their wins coming from five game encounters. Priscila Tommy got Vanuatu off to a quick start, with a 3-0 win. From then on in things were going to be a bit trickier. Vanuatu veteran Anolyn Lulu came up against the youthful New Caledonian Lorie La. Surprisingly it was La that took the initial advantage, notching up two games on the scoreboard 11-9 and 11-9. But her 2-0 lead quickly evaporated. Lulu powered her way back in to the match. Shots firing, she secured two games and levelled the score. It was a battle of opposing demeanours as Lulu roared while La kept things on the quiet side. But it turns out silence is golden. La took the final game 11-7 evened out the team score at one a piece. Another five game match was on the cards as Solenn Danger came up against defender Stephanie Qwea.Defense looked to be Danger’s undoing, as Qwea took the first two games 11-9. Deja vu? Tactics came in to play and Danger kept her opponent close to the table. The change worked. Qwea was left helplessly passive without Danger providing the pace. The New Caledonian took three consecutive games and put the composite team in to the lead. Priscila Tommy evened the equation with a 3-1 win over Lorie La, sending the match in to a decider. It was Anolyn Lulu and Melveen Richmond to decide the fate of their teams. Richmond looked fully in control, leading 1-0 and 9-7; but then served a fault. The slight change in rhythm was all that Lulu needed. Vanuatu took the game. Richmond looked a different player as the match seemed to be disappearing from her grasp. Lulu kept the pressure up, quickly stealing the third. But the composite team wasn’t going anywhere. A vocal bench put life back in to Richmond, carrying her over the line in the fourth game. The deciding match was going down to the wire. In the fifth game the players were point for point all the way. Both benches were rallying behind their player with cheers and jeers. But it was French that prevailed. Eventually it was Richmond that took the two point advantage and took the final game 11-9, to win the match. Meanwhile, the rest of matches went to the script. Hometown favourites Australia cruised to a 3-0 victory over the combined team of New Caledonia and French Polynesia in the Men’s Team event. The only hiccup along the way came as Heming Hu dropped a game to the spirited Alize Belrose. Belrose came out firing and sweated his way to a set. But the in form Hu quickly dampened the Tahitian’s spirits, closing out the match 11-5. Check out the full results for Men’s Team and Womens Team events.